Despite stiff opposition from restaurant owners, a divided San Diego City Council on Monday tentatively approved a ban on the use and distribution of polystyrene foam products, such as egg cartons and food service containers. The ban, proposed by City Councilman Chris Ward and approved on a 5-3 vote, would also prohibit the use and sale of items such as coolers, ice chests, pool or beach toys, mooring buoys and navigation markers made partially or completely of polystyrene foam, commonly called Styrofoam. 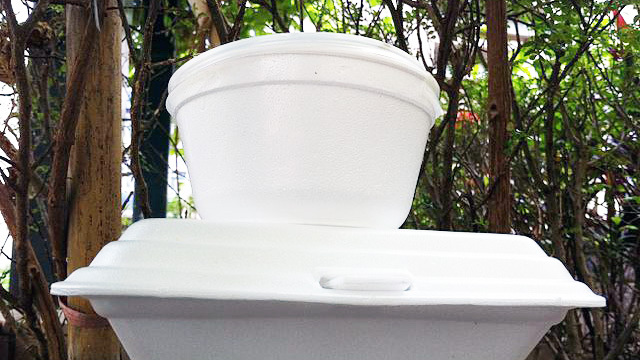 As part of the ban, the city’s Environmental Services Department would provide a list of safe, affordable alternatives to polystyrene products. The ordinance still needs to come back to the council for a final vote. City Councilwoman Georgette Gomez proposed a subsequently approved amendment to the ban that will provide a 12-month waiver for small businesses that bring in less than $500,000 annually. The City Council’s Rules Committee approved the proposal by a 3-2 vote in July, sending it to the full council for Monday’s debate. Polystyrene products don’t degrade the way more natural products do, taking hundreds of years to break down into smaller particles called microplastics. Marine and terrestrial fauna can and do mistake polystyrene for food. Opponents of the ban claimed it will have a disproportionately negative effect on local restaurants that may not be able to afford more expensive alternatives to polystyrene containers the way larger chain eateries can. Opposition speakers at the council meeting expressed support for education programs for residents to prevent littering rather than an outright ban. A study by the California Restaurant Association, San Diego Chapter, found that the ban could force small food-service businesses to spend up to 145 percent more for polystyrene alternatives like compostable paper. “We’re opposed to the ban because polystyrene is a recyclable product,” said Chris Duggan, director of local government affairs for the association’s San Diego chapter. Duggan compared polystyrene’s potential for reuse to that of an empty pizza box or a used paper plate and noted that polystyrene can be and is recycled into things like crown molding. Restaurant owners in City Council District 4, represented by Myrtle Cole, pushed back on the proposal Friday when they delivered more than 50 letters opposing the ban to Cole’s district office. Restaurant owners in District 4 claimed Cole has not met with them despite multiple requests to voice their concerns. One hour before Monday’s council meeting, Ward and Councilwoman Barbara Bry held a news conference urging the council to support the ban. Representatives from supporting organizations like the Surfrider Foundation, the 5 Gyres Institute, Business for Good and North Park Main Street joined Ward and Bry, who both voted the proposal out of committee. Meanwhile, a group of local restaurant owners and representatives from the California Restaurant Association held a news conference opposing the ban. After the vote, the association expressed concern about the council’s effort to pass the ban prior to the November election. City Council members Ward, Bry, Gomez, Lorie Zapf and Myrtle Cole voted in favor of the ban, while Mark Kersey, Chris Cate and Scott Sherman voted against it. City Councilman David Alvarez was absent. While a 6-3 majority would make the ban immune to Mayor Kevin Faulconer’s veto power, but the 5-3 vote with Alvarez absent makes the future murkier. If Alvarez is present for the second vote on the ordinance, it will likely achieve the veto-proof majority. Faulconer has not taken a position on the ban.